The muscle in the lower leg is grouped into four compartments. During exercise these muscles may engorge with blood, causing them to enlarge. If the compartment that they are in is not able to expand, pain, weakness, numbness and tingling may develop in the front or outer part of the leg. Usually occurs in well-conditioned athletes with low blood pressure. Tight fascial compartments that enclose the muscles. Incomplete hernias of muscle through small fascial defects do not allow the pressure in the compartment to lessen. Pain in the front, side or back part of the leg that occur at a specific time during an activity. The athlete starts to have pain during the activity and with continued activity pain worsens to a point where the athlete cannot continue to walk or run. Often relieved by rest. However, will quickly recur once the activity is resumed. Pain and tenseness to the involved compartment. The leg will feel firm or even rock hard. Numbness and tingling develop in the distribution of the nerves that are affected by this condition. Tingling in the toes and even a footdrop (foot slaps on the ground) may develop during the activity. Pain will almost completely resolve once the activity is completely over, only to recur the next day if the activity is resumed. Identification of this condition is important at the earliest stages. Activities may need to be modified to work below the threshold of pressure that causes the pain. Structural abnormalities to the lower extremity may need to be identified and treated with orthotics to lessen stress to the involved area. Physical therapy to strengthen weak muscles and stretch tight muscles may provide some limited benefit. Compartment pressures should be tested to evaluate the pressure relative to the diastolic blood pressure of the athlete. 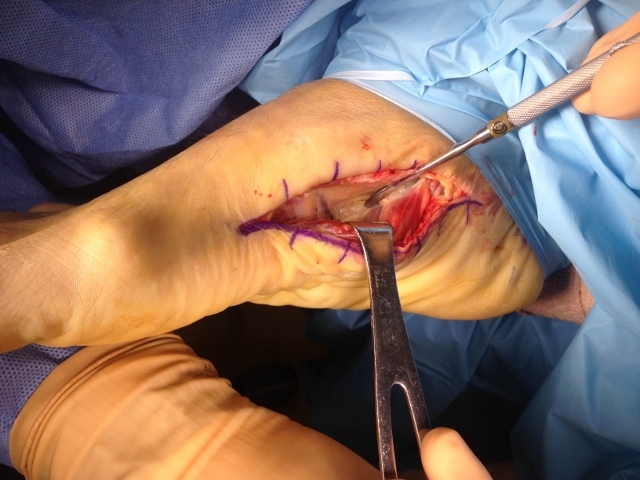 Pressures that are elevated above the threshold that are unrelenting, disallowing an athlete to participate in sports may require a simple fasciotomy to release the compartment and allow full return to all activities. Prognosis for conservative care for extremely elevated compartment pressures is poor. The athlete usually will need to cease the activity causing the symptoms, which is most likely a running sport. Prognosis is excellent if surgery is performed to release the compartment, thus allowing the muscle to expand without any restriction. Return to sports following surgery is usually 4-6 weeks. Intracompartmental pressure can be measured with a Stryker needle. 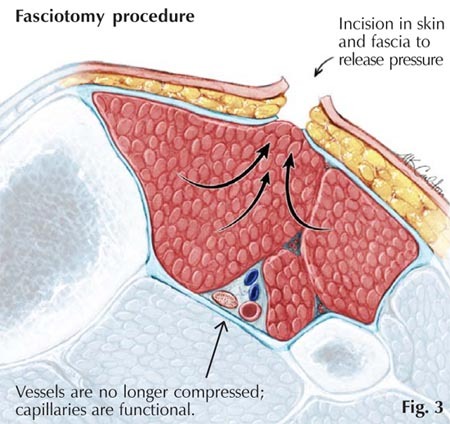 Fasciotomy has been recommended for compartment pressures greater than 30 mmHg, pressures within 30 mmHg of the diastolic blood pressure, and pressures within 30 mmHg of the mean arterial pressure (MAP). However, most rely on a clinical diagnosis rather than intracompartmental pressures if the patient is able to cooperate. 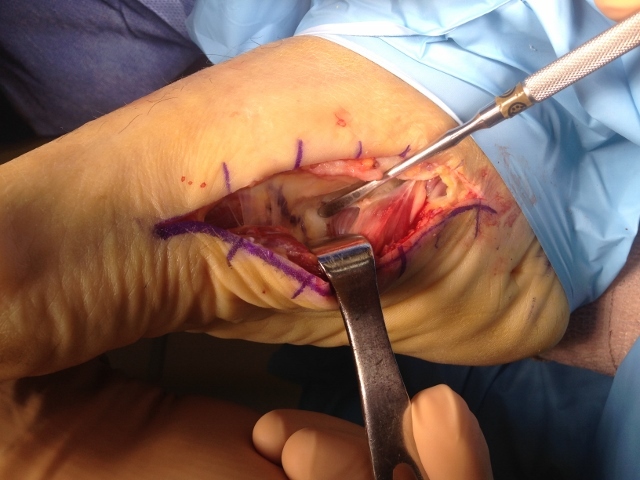 Treatment for acute compartment syndrome is surgical release of the involved compartment(s). Wherever the location, one or more generous skin incisions should be made and all constricting tissues should be released. 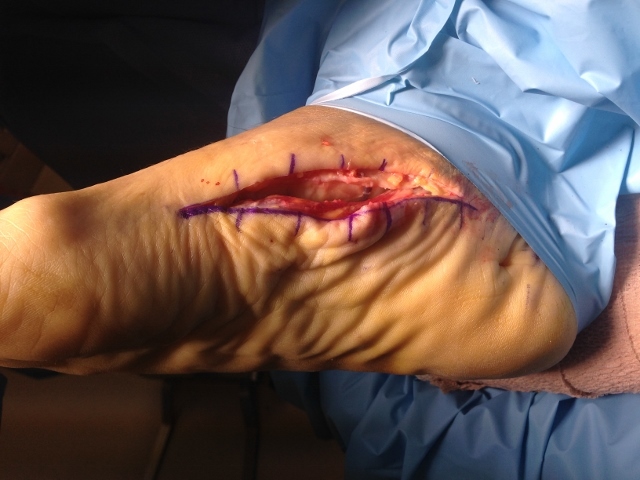 Small skin incisions with subcutaneous fasciotomies are not appropriate for acute compartment syndrome. 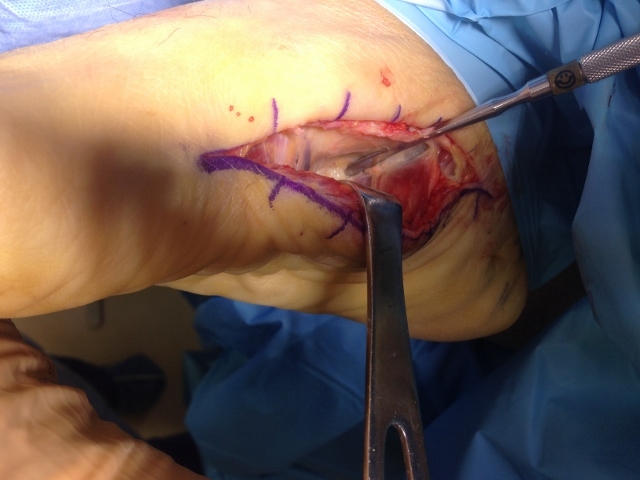 The most commonly performed fasciotomy is that of the leg. 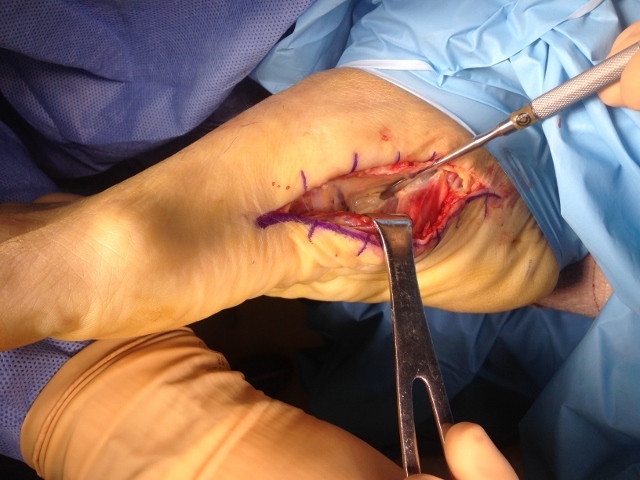 All four compartments of the leg can be released with either a two-incision (medial and lateral) or a one-incision (lateral) fasciotomy. 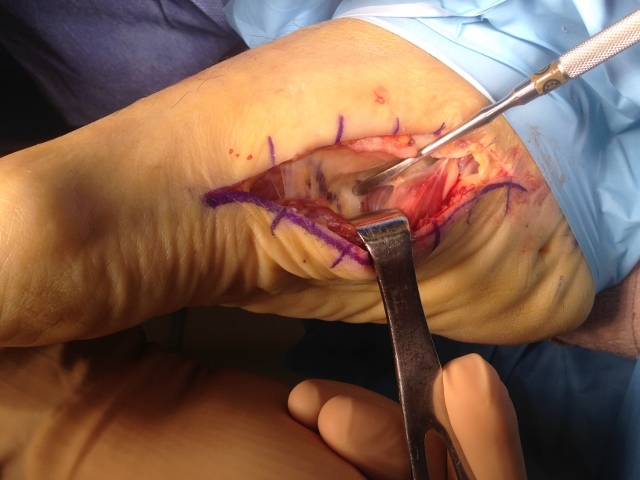 In the one-incision fasciotomy, the anterior and lateral compartments are released directly. 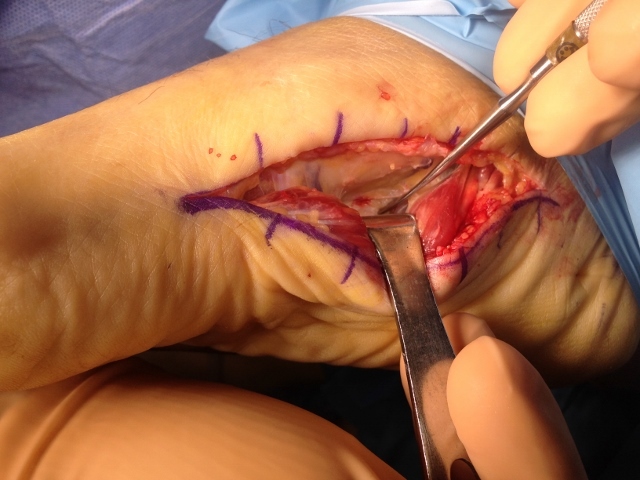 The superficial posterior compartment is released by elevating the skin posteriorly. 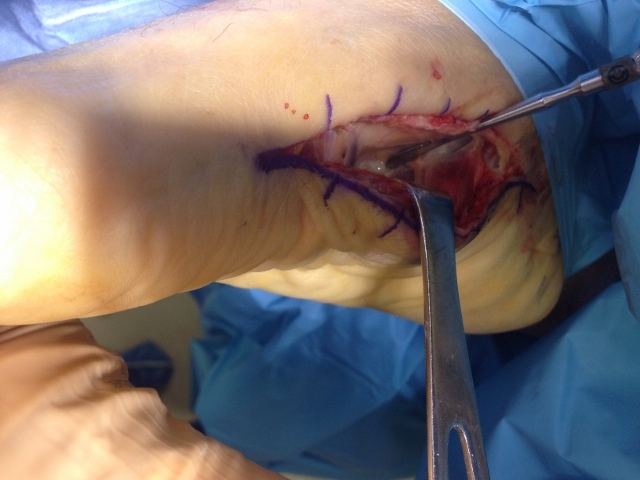 The deep posterior compartment is released by dissecting posterior and medial to the fibula. 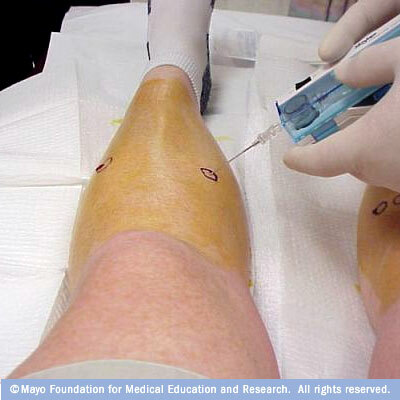 Complications of compartment syndrome are common, especially if the diagnosis is missed or delayed. Patients may have irreversible nerve and muscle damage. 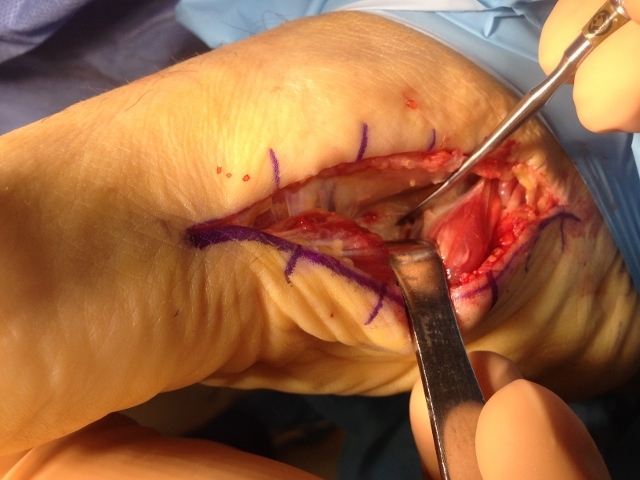 Damaged muscle may result in fibrosis and contracture. With large amounts of muscle involvement rhabdomyolysis, renal failure, and shock can occur. Fasciotomies can also result in complications such as nerve njury, infection, wound healing issues, and the need for flap coverage.